#Microsoft365 #Office365 #Windows – PC Literacy is something that simply cannot be ignored anymore – still we do exactly that. I know I sound like a broken record, but I’ll keep fighting this battle and I might not be able to change the world, but each company / person that I do reach – is a win for me. My mission in life is to “facilitate the evolution of human capability“. I love people and I love Tech. The fact that I can help people evolve with Tech, means that I have the best job in the world. (Ok, one day when I retire, I want to deliver pizzas with my Ducati Monster or my KTM SuperDuke and that will be pretty cool too!). If you want insights into why I’m so passionate about this topic, please read my Digital Literacy and IT Support blog. For now I’ll just focus on the waste due to inefficiencies in your company. In my session at Ignite 2017 and my Digital Literacy post I shared some statistics on PC literacy and the ROI on training. PC Literacy training is likely to have a major impact on productivity: this study reveals that those who have attended a course gain 33 minutes of productive time each day. 19.8 per cent of business time – the equivalent of one day per working week – is wasted by employees searching for information to do their job effectively,” according to Interact. Source: A Fifth of Business Time is Wasted Searching for Information, says Interact. We spend 20% of our day navigating to and searching for stuff. 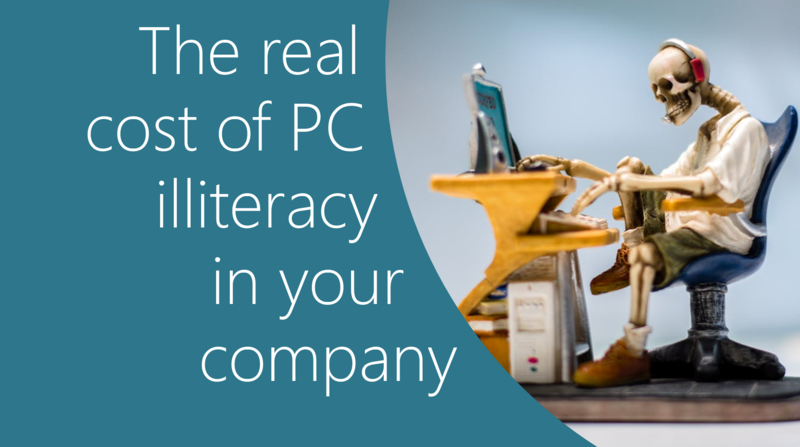 Only about 33% of our employees are what I would consider PC Literate and if you invest in your people with some PC literacy training, you could gain up to 33 minutes a day of productive time. I know that if I train employees the following (and they practice a bit and then use it), I could gain them much more than 33 minutes of productive time a day. For basic PC literacy I work on 45 minutes gain per day. I am not even including Microsoft Office yet – this is just Windows. Adding the basics for Word, Excel, Outlook and PowerPoint can easily change that to a productivity gain of 1 to 2 hours a day. No, I don’t have statistics to back that up, but imagine showing someone to create a Macro in Excel which will run a task in seconds that used to take them an hour a day? Or how to align shapes, use Morph and Design ideas in PowerPoint to cut down their presentation creation time to a third of the original time. Create recordings in PowerPoint for training videos to replace the 30/40 page manuals they used to build. As per the infographic below, the basic calculation of 45 productive minutes gained per day is the equivalent of a full month’s salary cost. If any consultant told you they could save you 8% (1,000,000) of your yearly cost of 12,000,000 and it would only cost you about 50,000 would you do it? Of course you would. Apart from the productivity gain, empowered users are happy employees. This affects your employee retention too. Let’s invest in our greatest assets and fix a foundation that’s been broken way too long.